"A must!" declared School Library Journal of this ALA Notable Book and National Book Award Finalist, now available in a glorious new hardcover edition. Blending fantasy and reality in a big-city setting, three unforgettable and wonderfully illustrated tales recount the adventures of Mitzi and her little brother as they attempt to visit their grandparents, recuperate from colds, and meet the president. I'd never heard of these stories before but the blurb was appealing as was the cover so I thought I'd give them a try. While they are not right for toddlers, the age group I each, they would work for 4 year olds on up till about 7 or 8. The stories themselves are not particularly enthralling, especially for the adult reading them, but the tales are a little slices of life with whimsy, a touch of fantasy, and a lot of repetition. The stories were a little long, my mind wandered, and I suspect that would be true with some children too. Mitzi was clever, independent, sneaky, and demanding. She and her brother kept their poor mother hopping! Children will relate to her and enjoy her antics, even if the telling of those antics is less than inspiring. The artwork however was fun, engaging, and full of cheerful color. The style was exaggerated and the pictures busy but the busyness also meant lots of details and there were some humorous touches. 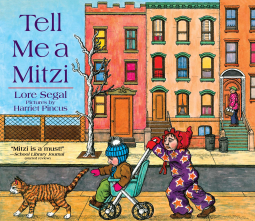 "Tell Me A Mitzi" wasn't wonderful but some children will enjoy it.